As I've mentioned before here, I've been running a sporadic Call of Cthulhu 7th edition campaign since Halloween 2014. Most of the adventures I've run have been new ones written for the 7th edition version of CoC (the only exception is "The Haunting"). 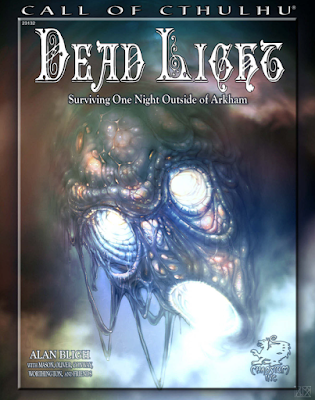 One of these adventures is Dead Light. Below is my brief summary of that adventure, along with some impressions of it. Dead Light (Massachusetts, late November 1922). - Helen Tilton (photo journalist). Pleased with their job dealing with the Corbitt house, Stephen Knott hires the investigators again. In addition to owning and managing several properties within Massachusetts, Knott is a collector of rare artefacts and eldritch texts. He has learned of an unusual item owned by a Dr. Godfrey Webb of Greenapple Acre cottage (located in a rural part of Massachusetts). After some correspondence with Webb, Knott has arranged to purchase this item, and wishes the investigators to pick it up for him and return it to Boston. He gives the investigators a cheque for $1000 for the item, about which he seems to know suspiciously little. The investigators drive to Bolton where they have dinner. A terrible storm is brewing, but they decide to press on. Continuing on their way, their car hits a woman who runs suddenly out onto the road. She seems dazed but not seriously hurt, and mumbles that her name is 'Emelia'. The investigators take her to a nearby diner. While there, the electricity goes out. The diner subsequently is attacked by … an eldritch ‘floating light’! An elderly woman is killed by the light – she is consumed from within by strange and malevolent otherworldly energies. Everyone is terrified, and the storm becomes even worse. Eventually Amelia revives somewhat, and explains that she is Dr. Webb’s niece. She and her uncle and were robbed earlier that evening at Greenapple Acre cottage. In the process of the robbery, however, the eldritch light attacked. Terrified, Amelia fled, only to later be hit by the investigator’s car. Mary Laker, who works at the diner, is questioned by Helen at this time, and confesses that she knows about the robbers. 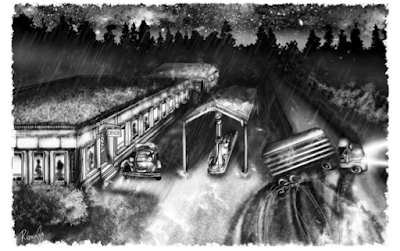 Despite the storm, the investigators, along with Amelia and Mary, proceed to the cottage. While at the cottage, the body of Dr. Webb is discovered. Shocked, Helen goes temporarily mad, and cannot see. Bertrand and Max rummage through Dr. Webb’s notes, and figure out that Webb has been summoning the ‘dead light’ for decades in order to eliminate ‘undesirable’ persons for clients. Horrified, they infer that Webb had summoned the dead light when the robbers invaded the house. The dead light creature returns, and consumes Mary. Fortunately, Bertrand and Max figure out how to defeat the creature from Dr. Webb’s notes. A ritual captures the dead light, and the party spends the rest of the night at the cottage. Helen’s sight returns, and the investigators concoct a story for the police in Bolton (something involving ‘ball lightning’). Amelia (now owner of the cottage) is placed in therapy. The artefact that Knott sought to purchase has been destroyed. This is the only scenario in this campaign that my group completed in a single evening (our sessions typically are 3-4 hours long). This was a good thing. Not because the adventure is bad -- I think it's quite good -- but because it is a 'survival horror' scenario, and I doubt that its intensity could've have been resurrected effectively after a significant break in play. As my summary indicates, Dead Light is somewhat different from most CoC scenarios. The investigators are fighting against a hostile enemy under dire conditions. The 'clock is ticking,' so to speak, against them. Moreover, they are thrust into this dangerous situation unexpectedly, and with little prospect of immediate escape (as most of the roads and telephone lines are down thanks to the storm). So it likely will offer a real change of pace for most groups. The sense of relief that my players had at the end of the session was palpable. The scenario would work well as either a 'one short' or an 'introductory adventure.' As an introductory adventure, the Keeper will need to come up with some reason for the characters to be travelling together, but once that is sorted, the events will force them to work together and to deal with a supernatural menace, thus giving them a connection for later scenarios. For my group, I had to contrive a way to make it follow from the previous scenario ("The Haunting"), but this was easy to do. Overall, I think this is a fun 'single-session' adventure, and am happy to give it 8/10. I’ve owned Arkham Horror for a decade now, and yet have never played it. Every time I’ve tried to read the rules in the past my eyes glaze over after a few minutes. Strangely, the AH rules seem more involved than those of Call of Cthulhu—and it’s not clear to me what AH does better than CoC (aside from being prettier and eliminating the need for a Keeper). Now I’d be happy to try AH with someone who was already quite familiar with the rules and could show me the ropes. But I just don’t have the patience or interest to sort them out myself. 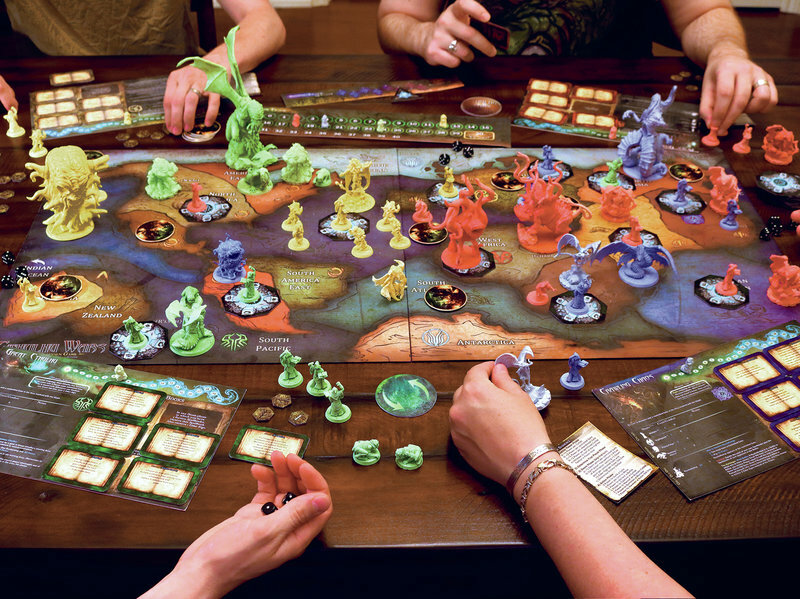 In addition to board games, there also seems to be a growth in the number of Lovecraftian role-playing games being produced in recent years. Yet, aside from playing in a couple of one-shots with other systems (including one game of Trail of Cthulhu), I’ve stuck with The Call of Cthulhu for decades—indeed, CoC is one of the games that I’ve played the most in recent years. CoC does what I need to do, really well, and I simply don’t have much interest or patience (or time) to learn new RPG systems these days. I’m happy to read about new settings or adventures, but reading new game systems generally bores me (in fact, I have yet to properly read through CoC 7e; when I’ve run that system over the past two years I’ve primarily relied upon the ‘quick start’ rules and my general knowledge of BRP). So while I’m happy to learn that more people are enjoying Lovecraftian games (both board games and RPGs) these days, I’m also pretty content to stick to the Lovecraftian game—CoC (5e/6e/7e)—that I’ve been using since eldritch times.